Pro calculates real-time Accounts Receivable and Payable balances and displays these balances in three ways. First, Financial reports can be processed per client/consignor and/or by date parameters and by sales person. 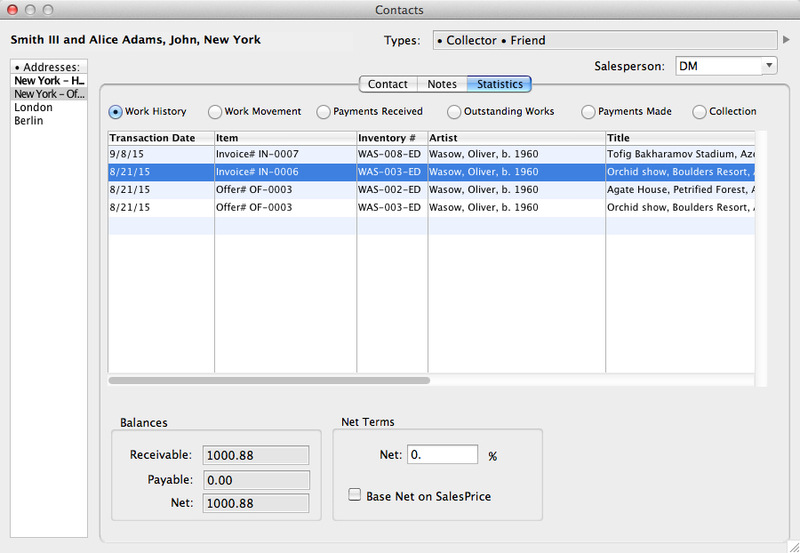 Second, each Contact record includes a snapshot of the sold inventory and balances due and paid, with individual links to invoice records and other transactions. And third, Cash Receipt and Payment transactions, created in the Transactions Module, calculate current balances as payments are applied. With Pro, one may designate any number of regional Sales Tax rates. Once set for a contact, tax will calculate for designated items on future invoices. Pro accommodates two tax values for regions with multiple Sales Tax calculations. Each tax rate can be set to be a applied up to and/or beyond an specified value. Pro also offers six VAT status options: Exempt, Export, Margin, Reverse Charged, Standard Rate, and Zero-Books. VAT Status and rate is set by the user and is adjustable. Values can be edited without affecting prior entries. Users may add more VAT Status entries to accommodate foreign sales. Invoice Documents with VAT comply with required VAT formatting regulations. 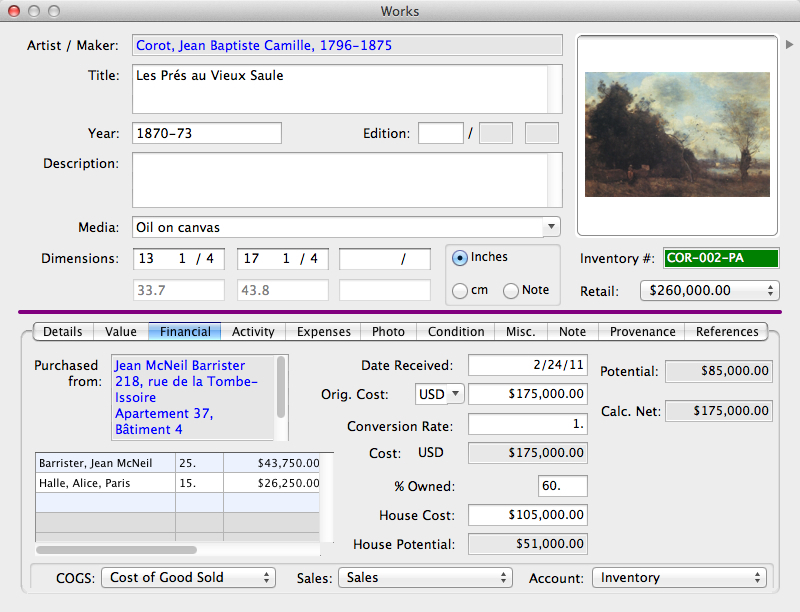 Pro can track accounting for Artist Resale Rights (ARR), also known as Droite de Suite. ARR applies to secondary market sales of living artists' works in countries in which it is in effect. An ARR value is entered by the user, who may choose whether to apply it to inventory. Pro has the ability to create offers, invoices, and cash sales in any foreign currency. The transaction records will display the alternate currency as well as the invoice values in the user's home-country currency. The currency conversion rate can be entered by the user or instantly updated from Reuters.com. The transaction document that is generated in MS Word will display only the alternate currency for your client. Pro's additional multiple-currency options — including the unique ability to base specific works in specific currencies through their history to avoid the vagaries of the currency market — are quite robust, sophisticated, and easy to set up and use. View a walk-through video highlighting some of these features that exist only in Artsystems Pro — no competing system comes close. In Pro, works can be co-owned, with interests divided up to six ways. Partners' shares can be entered as a percentage and calculated as a value in a selected currency, or entered as a currency value and calculated as a percentage of the total cost. Pro also calculates the user's 'house' profit, after deducting the share of expenses and partner shares. Upon sale of the work, Pro calculates monies owed based on ownership share and expenses and generates a payment form for each partner. Pro offers a comprehensive group of financial reports, including Accounts Receivable, Accounts Payable, Sales / Cost of Sales, Customer Statements (for all or just open invoices), Receipts Journal, Payments Journal, and Sales Tax. Additional reports meeting specialized needs can readily be created upon request. 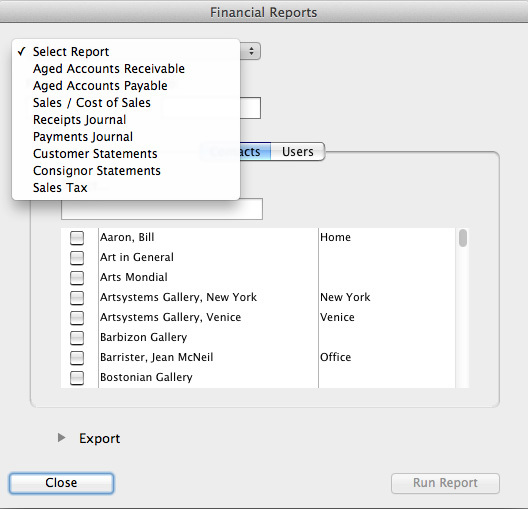 Each standard and custom report includes user-definable options such as specified period dates, include Shipped Transactions only, selection of only transactions prepared by or authorized by certain persons, or click on the Contact tab to select a specific Contact or group of Contacts to be included in the report. 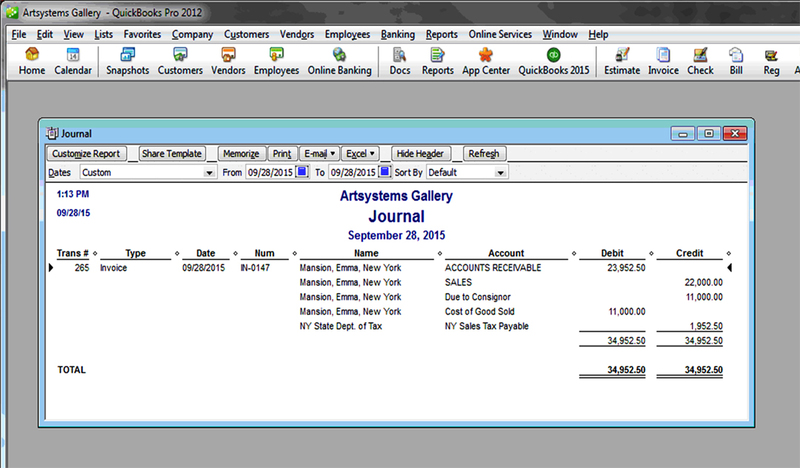 Artsystems Pro can link with both Mac and Windows versions of QuickBooks Pro as well as other third-party accounting packages — eliminating any need for a double-entry bookkeeping system.Invoices, Cash Sales, and Cash Receipts can import to QuickBooks Pro with just a few clicks. Users can also import their QuickBooks Pro chart of accounts into Artsystems Pro so that the accounts can be reconciled at the time of the transaction. 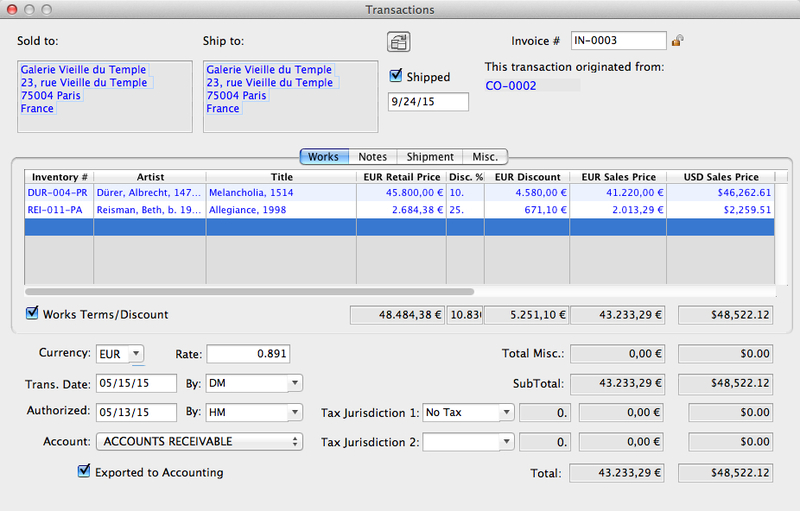 QuickBooks Pro imports the client details, transaction type, and the financial accounts and values. The inventory piece, work title, and artist/maker name also download into the QuickBooks item list.